In June of 2004, I arrived in Orvieto, Italy for the very first time. Completely by chance my vacation coincided with the Feast of the Corpus Domini (Corpus Christi) and its historical pageant Il Corteo Storico. It was a very happy accident, as it turned out. Those days before the main event were buzzing with excitement and anticipation. 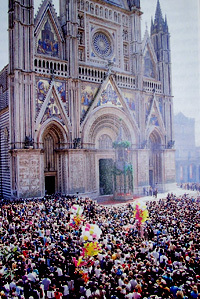 What struck me most was how the town’s entire citizenry enthusiastically participated in the preparation of what I would soon learn was the most important celebration for Orvietani specifically, and for the Roman Catholic world, most particularly. As I walked through the winding streets the evening before the festivities, the whole city seemed to be out in full force. The Comune erected special lights in the Piazza della Repubblica for the school children who were sitting on the cobblestone ground, constructing an infiorata (mosaic made exclusively of flowers). Everyone was working happily with their families way past midnight. Nearby, in the Piazza del Popolo, young men practiced sbandieratori (flag-throwing) alongside a falconer training his raptor for the next day’s performance. Utility workers on ladders were installing speakers hidden behind sprays of flowers tied with ribbon on the main route of the procession. The solemn mass would be broadcast throughout town (perhaps so that the elderly and house-bound were not left out). The energy was electric and I could feel thta something very special was about to happen. If you’ve ever been to Orvieto, you know it’s home to one of the most spectacular Duomos (Cathedrals) in all of Italy. At first glance, I remember thinking, “How did such a small town manage to build such a magnificent Duomo?” Its beauty and grandeur rivals that of the Duomos of Siena and Florence. Well, in order to build this Duomo it took a miracle: Il Miracolo di Bolsena (The Miracle of Bolsena) to be exact. In 1263, Peter of Prague, a priest on a pilgrimage to Rome, stopped at the tomb of St. Christina in Bolsena to celebrate mass. It’s said that he doubted Christ was actually present in the consecrated host, but became convinced when, during the consecration, blood began seeping from the host and trickled onto the altar and corporal. 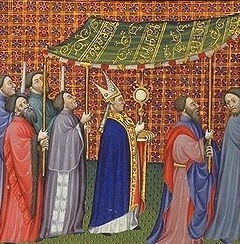 The priest immediately brought the bloodied linen to nearby Orvieto where Pope Urban IV was residing. In August of 1264, by way of a papal bull, Pope Urban IV instituted the feast of Corpus Domini and under his orders the Cathedral of Orvieto was constructed to commemorate and provide a home for the miraculous relic. It’s where it remains enshrined and exhibited today. In 1964, at the 700th anniversary of the institution of the feast, Pope Paul VI arrived in Orvieto by helicopter (the first Pope in history to use this means of transportation) and celebrated mass at the alter where the holy corporal is kept. 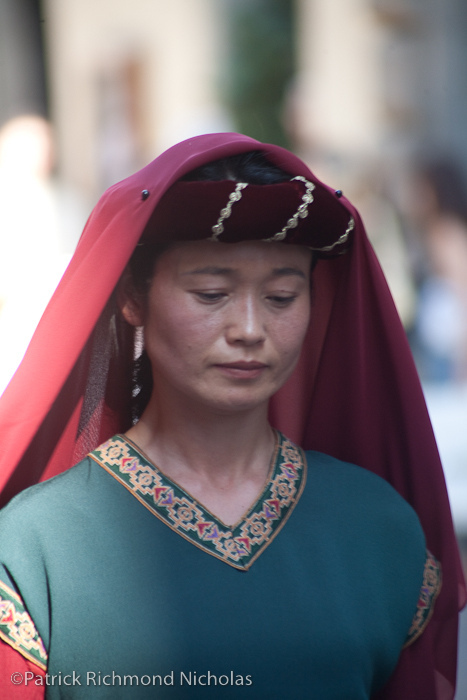 There are faces of people that I know very well walking in this parade, but when dressed in their historical and graceful garb, they become almost unrecognizable. 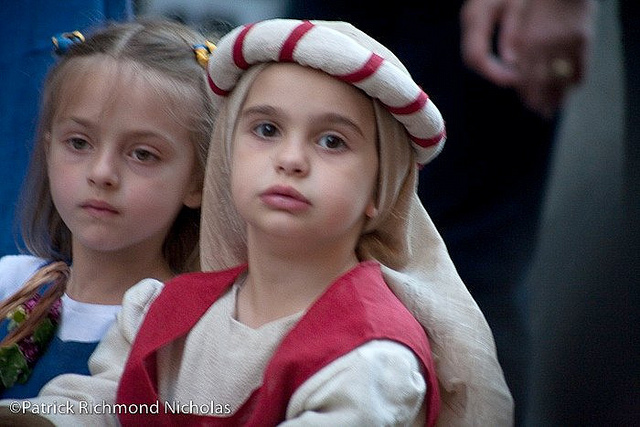 So authentic is their portrayal that I’m completely entranced and transported to Orvieto‘s medieval and Renaissance past. Over 400 costumes represent all the municipal courts of the time. 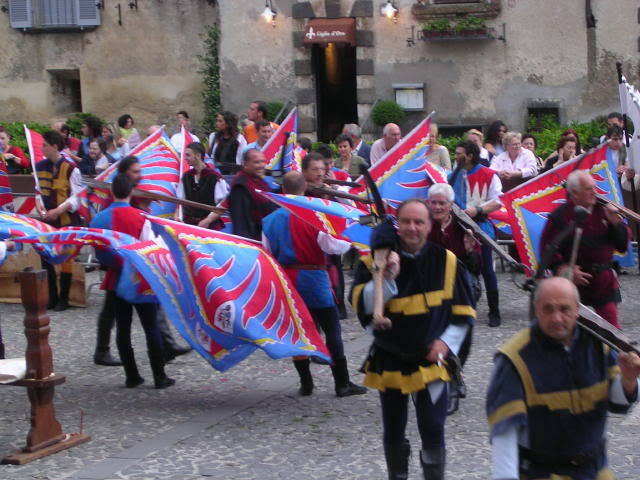 You see coats of arms from noble families, brightly colored flags and costumes symbolic of their social or political position and metal shields, armor, weapons, helmets all signifying Orvieto‘s military strength of the era. 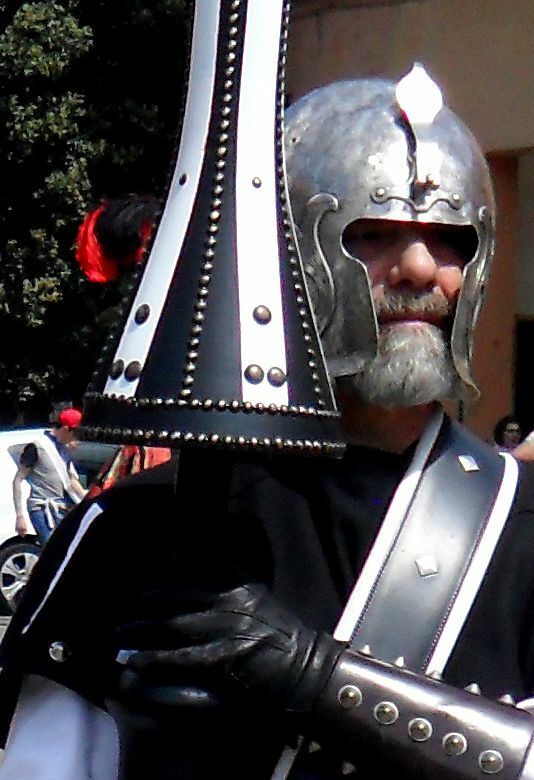 A friend tells me how he came to be part of the tradition of the Corteo Storico. It began for him when he was just a young boy in school. 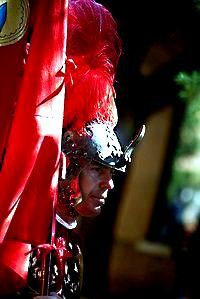 He was selected to be part of the procession – a great honor. Each year that he participated, he was rewarded with a more prominent position the following year. 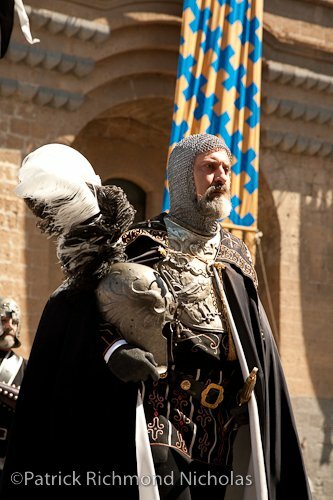 Now a grown man, he fulfills a respected role as a knight and is also one of the pageant’s main organizers. I think that one of the qualities that draws me to Italy time and again is its reverence and adoration for the traditions and folklore that are passed down to each generation. Corteo Storico is a supreme example of this commitment to its for-bearers. It’s widely believed that an important part of the present is to honor the past and those who came before. When one is dressed in his evocative and dazzling, handcrafted costume does he see in the mirror the life of his ancestor reflected back to him? I’d like to think so. You can only imagine that some of these young children today, just beginning their experience as members of the Corteo, will one day pass this tradition onto their children and grandchildren. They will build upon the collective memory of their medieval and maybe even their Etruscan roots thousands of years ago. Another friend of mine, Giorgio, returns to his hometown each summer to join with his childhood friends in the Corteo. It must be as important a ritual for Giorgio and his family as it is for Orvieto as a community. He is helping to keep the historical chain unbroken. 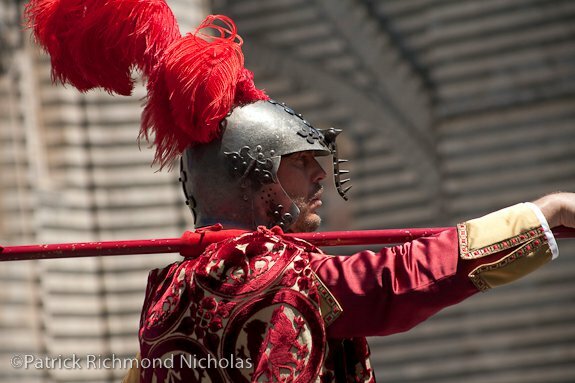 Friday, June 24 at 9:00 p.m.
Saturday and Sunday Medieval Market in the Piazza della Repubblica.